I saw Stanley Burns’s Sleeping Beauties at the counter of Dark Carnival many, many years ago. The collection of postmortem photographs shocked and startled me. Who would collect pictures of dead people? Who would buy a book of them? Fascinated, horrified, I closed the book cover and walked away with a shudder. I couldn’t get the photographs out of mind, though. 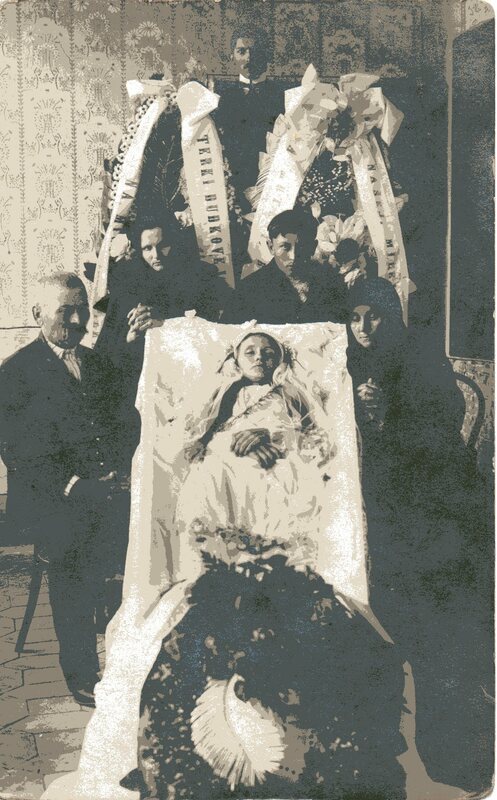 I understood that these after-death photos were often the only pictures families would have of their loved ones, because cameras were rare and professional photographers were expensive. I understood how a picture could be treasured, how it might be handed down in a family. What was harder to understand was how these photographs turned up in antique shops — and people actually collected them. Eventually, I bought this one on eBay. It’s a postcard, made so the family could share the news of their loss. This copy was never addressed, but it’s labeled on the back in even penmanship. It lists 10 names, even though only 5 people surround the young girl’s corpse. Most of them share the last name Duolok. Their first names range from Stefan to Lajos, from Marjena to Ameriki. I suspect that Ameriki is the young woman, dressed in the bridal gown she would never get to wear in life. She’s flanked by her parents, Hungarian immigrants to America who named their youngest in a passion of gratitude for their new lives. I’m guessing that the other people in the picture are siblings. No bridegroom is evident. I own several postmortem photos now, but this is my favorite. I used it as the cover image for Morbid Curiosity #10, the final issue. I meant the usage to symbolize dreams that die. I hoped to make the people lost in the past live again, to give Morbid Curiosity‘s readers a point of contact. I will never know anything more about the people in this photograph than I know now. Even so, the Duolok family has my sympathy. I understand their grief and appreciate the pain of their loss, because I’ve felt similar things in my own life. Their photograph ensures that they will not be forgotten. They have not been erased from history. This entry was posted in Books for sale, morbid postcard and tagged Morbid Curiosity magazine, postmortem photography. Bookmark the permalink.